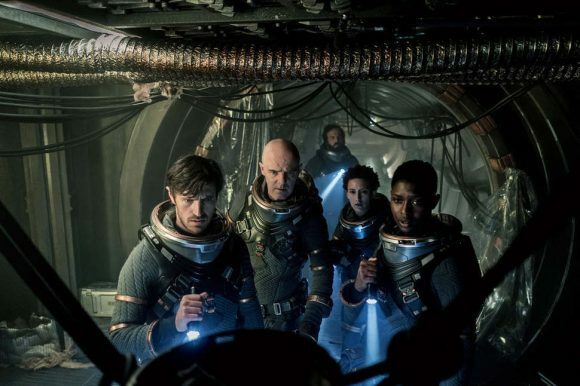 ☆☆☆☆ “Syfy is eager to push the George R. R. Martin connection when it comes to its new drama Nightflyers, boasting that the series is based on Martin’s novella of the same name and that the Game of Thrones creator serves as executive producer … Decently cast, interestingly claustrophobic and boasting occasional tiny bursts of inspiration, Nightflyers isn’t going to suddenly hook those broad Game of Thrones demos, but there’s an audience out there that’s always thirsty for hard sci-fi and this is for them.” — The Hollywood Reporter. ☆☆☆☆ “Nightflyers is propulsive enough, ginning up fear and terror even as it relies on hoariness … a fine addition to an onscreen canon that’s already well-stuffed — that of the space horror story. But it flails when it comes to doing anything new with a metaphor that’s been worn thin, that of space travel as an escape from grief.” — Variety. ☆☆☆☆ “Nightflyers is the kind of sci-fi show that wants to be different from all the other sci-fi shows, even though nothing besides said desire separates it from the pack. Sure there’s extra blood, extra darkness, and extra effects (which are quite good, honestly — even the spider robot), but the series is dependent on not telling the audience what’s going on in order to trick them into thinking something radical is happening.” — IndieWire. ☆☆☆☆ “It’s not as good as Paul W.S. Anderson’s cult favourite movie Event Horizon, which took the ‘haunted house in space’ sci-fi horror premise of Martin’s book and made it into trashy fun. Nightflyers the show is no fun. It’s a grim, drab, thematically underdeveloped plot delivery system. It’s a network show with a bigger budget and more blood.” — TV Guide. ☆☆☆☆ “Martin’s deal with HBO for Game of Thrones doesn’t allow him to play an active role in the production of Nightflyers. Much of what makes the show confusing and tedious is the work of series creator and chief writer Jeff Buhler, who has introduced a lot of needless malarkey into what Martin created as a relatively straightforward narrative.” — Reason.